Primary source for this article is the excellent book “Her Name Means Rose –The Rhoda Wise Story” by Karen Sigler S.F.O. availible by clicking here. Rhoda Wise was born on February 22, 1888 and was the sixth child of Eli and Anna Greer (nee Anna Poulson). They eventually had eight children, five boys and three girls. She was born in Cadiz, Ohio, however when she was two they moved to Wheeling, West Virginia. Her father Eli worked in the family trade of bricklaying. Her mother was very patriotic and became involved with the Ladies of the Grand Army of the Republic, an organization which supported the veterans of the Civil War, even serving as a state and a national president for a time. Her parents were staunchly Protestant and Rhoda grew up in the First Christian Church. There was a definite anti-Catholic bias in the family and among their friends. Rhoda often heard unkind remarks about Catholics and the Catholic Church. Nevertheless, she did have a few Catholic friends. Incidentally, when she was sixteen, Rhoda had a small encounter with Catholicism. While she was in Wheeling Hospital for an appendicitis operation, she received a visit from a Catholic Sister who gave her a St. Benedict medal. Rhoda explained to Sister that because of her parents dislike for the Catholic Church she would never be allowed to wear it, so Sister put the small medal in Rhoda's locket. Deeply touched by the Sisters kindness, Rhoda kept that hidden medal for the rest of her life. Rhoda married Ernest Wissmar, a young widower from Canton, Ohio, in November of 1915 and moved to Canton, Ohio Their marriage was not a happy one and ended tragically six months after it began. Ernest suffered a cerebral hemorrhage and died at a home where he was doing plaster work on May 16, 1916, leaving Rhoda a widow at twenty eight. She met George Wise soon after Ernest's death and she married him on January 27, 1917. Although she loved him dearly, George was a drinking man and the next twenty-three years of her life were plagued by countless struggles, embarrassment and financial difficulties that kind of life can cause. Shortly after their marriage, George and Rhoda adopted a baby girl and named her Ruth. This little one lit up their lives for nearly a year until the Spanish flu epidemic that plagued the world at that time snuffed out her young life just eight days before her first birthday. When the pain of Ruth's death eased, in 1922 George and Rhoda adopted a lovely child named Anna Mae, whom they loved dearly. 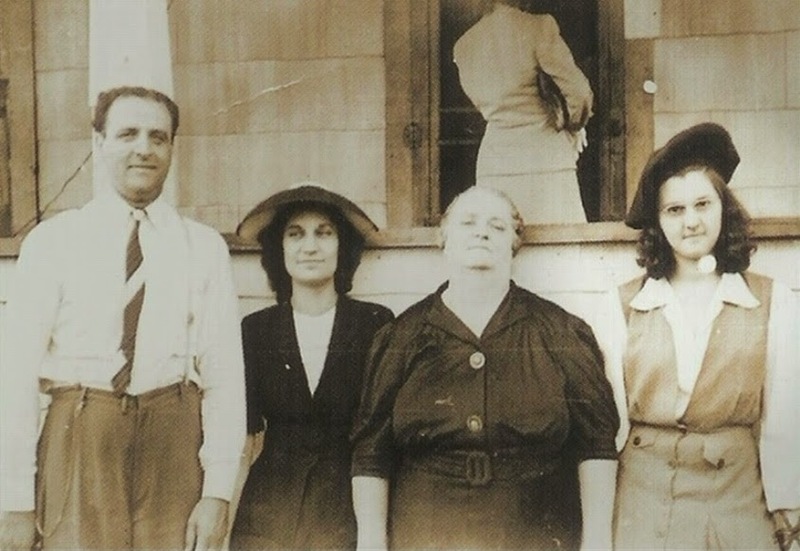 Anna Mae would be their loving daughter and consolation for the rest of their lives. In the early years after Anna Mae was adopted, George and Rhoda moved seven times, presumably because of Georges’s drinking problem which we can surmise caused him to change jobs frequently. In the end, 2337 25th St. NE in Canton, Ohio (the location of the present day Shrine) was the only home their daughter Anna Mae would remember. Nine years after Anna Mae was adopted (1931), Rhoda developed a huge, 39 pound ovarian cyst. The cyst was so large in fact, there wasn't a doctor in Canton willing to attempt its removal. Rhoda eventually found a doctor in Wheeling who would perform the surgery, but even he was not sure if she would live through it. She survived, but the cyst and the surgery negatively affected her gall bladder, which soon needed to be removed, and then later another surgery was needed for an obstruction in the bowel, which had become painfully impacted. In December of 1936, she accidentally stepped into a sewer drain, which severely damaged her right leg, causing an infection and turning her foot inward. Thus began a long series of hospital visits, necessitating many leg casts in an effort to repair the damaged leg. Additionally, it was discovered that the earlier incision in her abdomen had reopened, causing a severe infection surrounding the incision. This would soon become a major problem. But for now, because of her damaged leg, she was mainly confined to bed from this point on, and returned every few months to the hospital for either a new cast or another operation in an effort to straighten the leg or to be fitted a new cast. It was at this this time that she was given the first of many visions. One day while she was confined to bed, Rhoda called George and Anna Mae into her room and said, "George, do you see Our Lord in the window? He is dressed as a shepherd and holding a lamb. George, Our Lord is handing you the lamb. Please take it"
George walked away muttering under his breath. Anna Mae just stood there; she didn't see a thing. Then Rhoda said to Anna Mae, "Our Lord is handing you the lamb. Please, take the lamb." Anna Mae still saw nothing but held out her arms in a gesture to receive the lamb. Her mother smiled and turned her head toward the window. No doubt George walked away thinking his wife was headed for a breakdown, but Anna Mae was left with an entirely different impression, and in her later years recounted this incident often and with great emotion. At the time, however, no one paid any further attention to it. Rhoda's sufferings grew worse by the day, but the nursing sisters at Mercy Hospital were a great consolation for her in the midst of it. She spent so much time at the hospital that she knew most of them by name. Dressed in their long white habits and veils, the Sisters of Charity of St. Augustine looked like angels of mercy to her. She became especially close to one named Sister Clement. Sister Clement was greatly devoted to Saint Therese of Lisieux, and she gave Rhoda a little shrine to St. Therese, “the Little Flower”, enclosed in a glass ball, and she told Rhoda a little about her. Rhoda didn't pay much attention, but kept the shrine at her bedside. Sister Clement also gave her a prayer to Jesus and the Little Flower which Rhoda said only because she thought so much of Sister. When Sister Clement explained that St. Therese could help her in many ways, Rhoda told Sister flat out she didn't believe it, even laughed at the idea -but it didn't harm their friendship in the least. Rhoda dearly loved the Sisters who took care of her at Mercy. In September, Rhoda was attracted to the crucifix on one of the Sister's rosary. When Sister came over to her bed Rhoda took the crucifix and held it in her hands. Heat radiated from the crucifix as she held it. "Sister, will you teach me how to pray the rosary?" Rhoda asked. The Sister initially said no, as perhaps she had heard about Rhoda's reaction to St Therese. But Rhoda kept asking, and Sister eventually taught her. This Sister also gave Rhoda her first rosary, prayer book, and Sacred Heart Badge. From that time on, Rhoda prayed a rosary for the nursing Sisters every morning and night. As Rhoda continued to pray the rosary, she began to have questions about the Catholic faith. When they came to mind she would write them down and ask Sister Clement the next time she saw her. One time Sister Clement explained about nine days of prayer called novenas that could be made to Jesus, Our Lady, or the saints for a special intention. She suggested a novena to St Therese- the Little Flower, but Rhoda wasn't yet ready for that. As month progressed and she remained in the hospital, Rhoda's spirits fell. As each day passed, she was getting worse, not better. In early December, Sister Clement found Rhoda crying and when she asked what was wrong, Rhoda answered, "Sister, can we make that novena to the Little Flower now?" They began the Novena to St Therese that night. And, from that night on, Rhoda grew closer and closer to the Little Flower and prayed to her constantly. She was in such discomfort that often she could not sleep and would spend her days and much of her nights in prayer. your promise to descend from Heaven to visit those who implore you. Pour down upon us in profusion those Celestial Graces that are symbolized by the shower of roses that Jesus, your Spouse, had put at your disposal. Your power is great with his Heart. He can only listen and hear your prayer. I have recourse to you then, O Saint Therese of the Child Jesus; assist me in this need. Speak for me to Jesus and to Mary and obtain for me the grace to live a holy life and die a happy death. Amen"
And now, Rhoda’s thoughts were centered on becoming Catholic. The Protestant patients in her ward tried to discourage her from continuing the Catholic practices that were absorbing her time and attention. Some of them even sent their ministers over to dissuade her. But her heart and will were steadfast. Sister Clement told Rhoda that she needed to talk to a priest to become a Catholic, and she immediately knew which one she wanted to talk to, although she did not know his name. She had seen him visiting other patients in her ward. When she described him, they told her he was Monsignor Habig of St. Peter's Church. The nurses called Monsignor Habig and he quickly responded. He questioned Rhoda regarding her faith, her reasons for converting, and her family. Satisfied with her answers, he asked if she was willing to take some instruction on the Catholic faith. Rhoda responded yes. Because she was so ill, Monsignor Habig gave her a small catechism and instructed her himself during the seven days between Christmas and New Years. 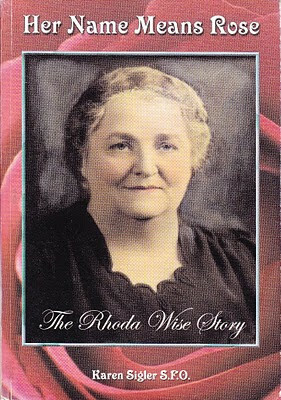 On January 1, 1939, Rhoda Wise was brought into the Catholic Church. She received her First Holy Communion on January 2, the anniversary of the Little Flower's birth. The new year also brought Rhoda another abdominal surgery on January 4. It would be her last. The surgeon could not close her abdomen properly because there was no longer enough tissue there to hold together and suture. It was to be her last surgery. She was left with an open hole in her abdomen. By January 10, her bowel was protruding through the hole, and on February 8, secretions from the bowel began to drain out and burn her skin. There was no salve available at that time strong enough to protect her skin or to ease the burning. Eventually, all the skin on her abdomen was burnt raw from this drainage. Through all of this, Rhoda and Sister Clement kept their novena to the Little Flower every evening. And soon St. Therese the “Little Flower” would play a remarkable and unexpected role in her life. To give her some hope, the doctor told Rhoda he would operate again, but her repeatedly put it off from day to day. He called the family aside and told them she had cancer. No one men¬tioned "cancer" directly to Rhoda, however. As day followed day and nothing more was being done, Rhoda asked if she could go home. She was told she would not be going home for a very long time. On February 12th her doctor walked in. "Rhoda, are you making out your will?" "No, I am starting a diary. Doctor, when are you going to operate on me?" "I'm not going to operate, Rhoda. I'm afraid I have done all I can do." "Are you saying I'm not going to get well? Am I going to die?" "Rhoda, I've done all that can be done. You may live a long time yet, or just a little while. I have no way of knowing. All I know for certain is that I've done as much as I can. I'm sorry." Although it was a blow, Rhoda took the news well. She had suffered for so long that she understandably did not care to live longer. February 19, 1939: "Last night my incision bled quite a bit and scared me. I seem to have a feeling I may get better. Probably St.Therese is hearing Sister Clement's and my prayers. I have started a novena of my rosary that I may get well. My rosary has meant everything to me since the first day I received it from Sister. Little did I dream then there would be such a change in my life .... "
February 23: " ... A lot of who I thought were my best friends I have lost because of my religion. Then this trouble of my own and all the other things I have to trouble me just seems too much. They say suffering and trouble only bring us nearer to God and I know I am close to Him, but I want to be closer still." February 24: "Today is cold and like winter. My stomach hurts me quite a bit and I am all nervous. A woman down the hall is screaming awful because she does not want to die. Why does one fear death so much -unless they have not lived right and served Him must be the reason. I don't seem to be afraid because when we think of all He promises us over there and we are living close to Him as we can, there is nothing to fear. As far as I am concerned if I must go, I wish it would be soon so I don't have to lie here and be a burden to anyone. It has to be His Will, not ours be done, and I must be content and do as He wills. I try to be brave, but sometimes I cannot ... George has forgotten me today, but I don't let it get to me anymore than I can help .... "
February 25: " ... I am saying my rosary, and how I love my rosary .... "
February 28: "I had Communion this morning and it is wonderful to be able to receive it. .. Little Flower, help Sister Clement in all her work. Teach me to pray the way I should. Sister Clement doesn't realize how hard I am praying to you and she is the one who taught me how .... "
By March, Rhoda's suffering was intense. Her bowel drained constantly and required frequent changes of dressing. The odor, the mess -it does not take much imag¬ination to understand why Rhoda was not a favorite patient among the nurses. Still, Sister Clement was a faithful friend and kept the evening novena to the Little Flower with Rhoda as often as possible. Sister even went out of her way to take Rhoda to the Chapel to show and teach her the Stations of the Cross. March 1, 1939: "It sure came in like a lion, and how. I don't feel so good and the poor nurses are having to do my dressings so much and they are awful. I am having an awful time. 0 God, hear my prayer and if I cannot get well, please don't let me have to be here long like this. I know it is Thy Will not ours be done, and oh, may it be I don't have to be like this very long .... "
March 8: "…I am so miserable. I don't know what to do "
March 10: " I am so mean. I just cannot help it. I had company but I wished they would go home. I just wonder how long I must be like this. Msgr. Habig says God must love me a lot to make me suffer the way I do .... "
March 15: "Today my incision is worse than ever. I really don't know what to do. They have to do my dressings so much they are making me dizzy. It seems they could do something for that burning. . . They do my dressing about every half hour .... "
March 25: "…I feel tonight as if even God has forgotten me. I just cannot bear anymore. I know I am going to be in terrible misery if I go home and do not have someone to do my dressings all the time. I know I cannot get the care I need for it takes money to do that and there isn't any ... Oh God, I wonder what the outcome will be. You have never failed me yet, dear Jesus, and I know you won't now. When the clouds were darkest and I was in despair you always showed me a way out, so I'll just trust you to take me out of this .... "
In April her intense suffering continued, mixed with deep faith and prayer. 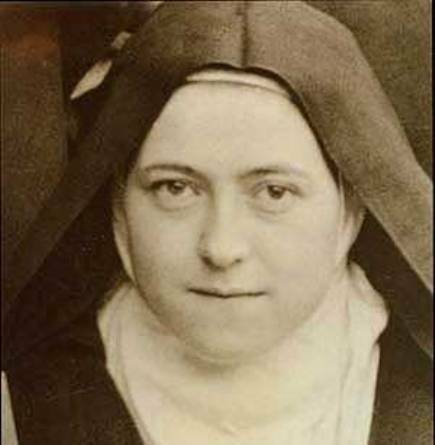 April 20: "…I am praying so hard to St. Therese and she is going to help me. She seems so close to me. I am not laughing now, Little Flower, but trusting and praying I may be helped. I could look at your beautiful picture all day. All I do is look at your picture and whisper a prayer for help. I know you are listening to me. Won't you please help me?" April 21: " ... How I love my rosary! I repeat it many times a day .... "
On April 28th her Doctor told her that after a thorough research amongst his colleagues both near and abroad, there was nothing that could be done for her and that he was sending her home to die. In her diary on May 16 she writes: “…It is awful to be like this. God, if I am not to get well, let me die right now. Each day I wish there would be no tomorrow. I did not think it possible for anyone to suffer so much. This drainage about sets me crazy. If I could go to sleep for just one night it would be heaven for me. Little Flower and Jesus, I am praying so hard for you to make me well, and if that is not to be, let me die at once. These dressings are terrible. No one wants to do them. I can hardly do them anymore either." May 22, 1939: " ... My stomach is so raw from that irritation. I don't know what to do. God, how much longer must I suffer like this? Little Flower, why won't you hear me? I cannot pray any harder than I am. Please hear me." May 27, 1939: " ... All I want to do is cry. I just don't seem to be able to stop. Oh Little Flower, I will never stop praying for you to help me. You suffered so much when you were on earth, and do you think I am a baby and cannot take it?. ... "
On this day, May 27th, it truly seemed the end had come. But who could have ever guessed the extraordinary ending? May 28, 1939: "What is last night or early this morning going to mean in my life? Some people say I was dreaming and some say I was delirious. I was neither. I was wide awake and saw Jesus sitting right by my bed . . . I tried to make George get up and he said I was dreaming or seeing things in my sleep. He (Jesus) was gloriously beautiful. I never saw a picture as beautiful as He is. His robe was beautiful. It was gold with every color in it. I just wanted to touch it and see what it was like. I could see the marks on his forehead where the Crown of Thorns had pierced His brow. Just as I tried to touch His robe He said He would return in thirty-one days. As I tried to touch Him He vanished. I would not let George have any rest until He got up and brought me the clock. It was 2:50AM. I told George all about what I saw, and he said I must have been dreaming. The next morning I told him again. He still would not believe it. It was no dream. He says he heard me talking and thought I was talking in my sleep. My bedroom was as light as it could be from Him. When I saw Jesus by my bed I really thought my time had come, but I was not one bit afraid. I said, 'Have you come for me?' and He said, 'No, your time has not come yet.' He said He would return in thirty-one days. I am wondering if He will. If He says He will, I am sure that He will. Everyone I told said I was dreaming, but I know that I was not and saw Him as plain as I see anyone. I cannot seem to explain it. It is so wonderful to me. I don't care what anyone else says. They cannot tell me I did not see Jesus and talk to Him. I wish Sister Clement was here so I could tell her about it." May 29, 1939: "I am still no better and all I can think of is what I saw. I wonder if He means He is coming in thirty-one days for me. I hope He does, but I wonder how I am ever going to suffer that much longer .... "
Rhoda passed out shortly after this last diary entry and lapsed in and out of consciousness for the next two weeks. She awoke in Mercy Hospital where she had been admitted on June 9th and treated for a bowel impaction. She stayed in the hospital for a few days and then was sent back home, suffering all the while. And then came the 31st day from Jesus’ first appearance. June 28, 1939: "I guess everyone will say I am dreaming again or seeing things. What happened to me was done by no dream. I saw Jesus again last night standing in my bedroom door. While I looked at Him, He said, 'Here I am as I said.' St. Therese, the Little Flower, was right by Him. She came to my bedside. She wanted the cover off me. I pushed it off She wanted the dressings off so I pushed them off. She put her hand on my stomach and said, 'You doubted me before. You have been tried in the fire and not found wanting. Faith cures all things.' She walked back to Jesus and when I looked at Him He said, 'I will come again. There is work yet to be done.' They vanished. I looked at my stomach. I was entirely healed. Not one drop of anything had even run on my stomach. That awful irritation and everything was gone. What my feelings were I can never tell…." Rhoda tried to tell George the next morning what had happened, but he wouldn't listen, so she let him go off to work without showing him anything. She tried to reach Msgr. Habig, but he was out of town. She couldn't reach Sister Clement either, so she wrote her a letter describing everything that had happened. Rhoda told Sister she wanted to jump out of bed but her foot wouldn't let her. She hadn't thought about asking St. Therese to cure her foot, but the instantaneous cure of her abdomen was an absolute miracle which filled her heart and soul with unimaginable joy! She kept the incredible secret for two days until she could tell Monsignor Habig, however soon the remarkable story was out, and no one could believe their eyes. The horrible abdomen wound will all its accompanying bowel leakage was completely healed. Out of thanksgiving to God, Rhoda happily repeated her story over and over again to everyone who asked. June 30, 1939: " .. .I was lying here writing to Sister Clement when who should come in but Monsignor Habig. I told him at once what had happened and he seemed as happy about it as I am. He took my letter over to Sister Clement and she (and Sister Florence) came right out. They were very happy over this. I feel my knowing Sister Clement had a lot to do with this. If I had not known Sister Clement, I probably would not know about the Little Flower. It's as much a mystery to me as anyone. " "In fact, many things are a mystery to me. My turning to the Catholic faith and everything connected with it. One thing I know -I have had many worries and troubles but through it all I have trusted and had faith that I might get well. Of course, I never dreamed that I would get well in this way that I have. All I can say is that when I thought there was no help and I was at the end, Jesus saved me, and I feel sure that the Little Flower asked Him too. No one who has not been through what I have would ever know the misery and pain I was in. For six months I laid here in a wet mess all the time and that irritation was more than I could stand. I never missed praying every day. Every time I saw my doctor I would ask him if I was going to get well. He always told me no." Everyone around me says they will never doubt God again. I never have. I knew He would do what He thought best. He did, and I will devote my whole life to working for Him in any way He wants to use me." July 1, 1939: " ... So many people came today. Many praised God and cried for joy over what has happened ....And thus began her apostolate of leading souls to God. Aug. 10, 1939: " ... Tomorrow I go in the hospital again. God, may this be the last cast, and if it is Thy Will, may my foot be straight and may I walk. "The cast they applied to Rhoda's foot was to be on until November 10. Rhoda's doctor told her there would be a person ready who would fit her with a brace as soon as the cast came off, and that she would be wearing the brace for the rest of her life. He and everyone else was about to see for a second time that Jesus and St Therese had other plans. Aug. 15, 1939:[Feast of the Assumption on the Blessed Virgin Mary] "Oh, what a day! I was so happy to begin with because the Little Flower came to me and cured my foot. I was sitting up in bed and crying because my foot hurt me so much. The Little Flower came and said, 'That is a little thing. Stand up and walk.' I stood right on my feet and the cast broke and I stepped right out of it. She said, 'Go to church now' .... "
Another miracle! Who can imagine the joy of Rhoda, her family and all who knew her! George nearly fainted when he walked into the room and saw her standing on her own, the cast shattered all over the floor. Needless to say this second miracle drew a flood of persons wanting to see and talk to the woman of the miracle. Her apostolate of leading souls to God was now well underway. Later in the month of August another extraodinary miracle occurred in the Wise home, and though it received no attention whatsoever, Rhoda considered it the greatest miracle Our Lord worked for her--Her husband George stopped drinking “cold turkey”. He had come home one night and went to bed only to find Our Lord standing in front of him. George didn't want to see Jesus, so he turned over. Our Lord was there too. Every way George turned, Jesus was there. When Geroge told Rhoda this extraordinary story, she immediately called Monsignor Habig who came to speak to George. "Well, did He say anything to you, George?" Monsignor asked. "No, He didn't have to," was George's reply and all he had to say about the subject. On August 21, George, his brother, sister-in-law, and Rhoda joined Monsignor Habig for instructions in the Catholic Faith at St. Peter's. Before the year was out George would receive Holy Communion beside his wife. In another year, Anna Mae would join them. Six others from both George and Rhoda's families converted as well. And then there were the countless souls who thronged to her house each day to see and speak with “the woman who was miraculously cured.” God alone knows how many souls returned to Him after witnessing His love and mercy revealed in the life of Rhoda. Along with the many pilgrims came more cures. Surely the most well known healing was that of Rita Antoinette Rizzo, now known as Mother Angelica, the Foundress of Eternal Word Television Network [EWTN]. In January of 1943 when Mother Angelica was nineteen she suffered from a painful condition known as "dropped" stomach. The story of her healing is recounted in the book "Mother Angelica: The Remarkable Story of a Nun, Her Nerve, and a Network of Miracles” by Raymond Arroyo. To summarise the story, the young Rita Rizzo [Mother Angelica] was at her wits end because of the pain in her stomach. She was brought to Rhoda on January 8, 1943. Rhoda gave her a Novena prayer to St Therese to recite, asking the intercession of St. Therese. On the last day of the Novena to St Therese, Sunday January 17, Rita Rizzo woke up in the middle of the night with a strong, sharp pains in her stomach -"It seemed that something was pulling my stomach out", she later claimed. When she woke up later that Sunday morning, she immediatly thought of putting on the corset around her waist, which helped to avert the pain, but she "heard" and inner voice telling her to get up and she then realised that she was miraculously cured. She looked into the mirror and indeed the bluish color around her waist and also the bulging lump on her lower abdomen was gone. Over the many passing decades the stomach problem has never returned. On Good Friday, April 3, 1942 Rhoda was given the Crown of Thorns and her forehead bled for the first time. Every Friday afterwards, the red marks on her forehead opened, and she would bled from 12:00 noon to 3:00pm. Blood would also come forth from her eyes. On June 2, 1942 Jesus appeared to her in a vision and told her “..to save souls, one must suffer.” Her apostolate was now clearly that of a victim soul. On the first Friday of November, wounds appeared on her feet. On this day, blood issued from her forehead, her eyes and also from the wound in her left foot. The outward manifestation of the bleeding stigmata would contine and later in 1944 she began also to have the stigmata in her hands. “…Rhoda Wise was a holy soul. Few knew her as well as I and I can testify that Our Savior filled her heart with a great love for God so that she was willing to endure the greatest suffering for His sake. Soon afterwards in honor of our Lords request a small altar room within the home was created for pilgrims to pray. 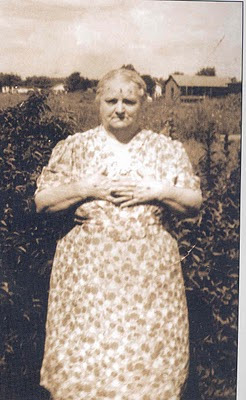 After Rhoda’s death, her daughter Anna Mae continued to keep the house open for pilgrims for 47 years, until her death in 1995. She left the home to Mother Angelica and Eternal Word Television Network, and in October 2001, the home of Rhoda Wise became the property of Our Lady of the Angels Monastery, which is the Monastery that Mother Angelica founded. The Rhoda Wise House and Grotto is open daily to visitors. Graces and favors from the Sacred Heart, the Little Flower, and Rhoda are being reported. In 2001, a Grotto in honor of the Sacred Heart was built on the site. Rhoda's home/grotto is located at 2337 25th St. NE, Canton, Ohio. ~Rhoda Wise, pray for us! ****UPDATES: After an informal investigation, Bishop George. V. Murry S. J. gave the Nihil Obstat to the work of Rhoda Wise Shrine, Inc. on June 9, 2015. I learned about Rhoda Wise through your Mystics website and I sent away for the book and information on Rhoda and I just received the information this week. They were very prompt in sending out the items I ordered. I've already started reading the book and it is very interesting to read so far. Thank you for your kind comment. I think you are really going to enjoy reading the biography of her holy life. I found it very inspiring and interesting. Speaking of her, her spirtual director once said "the finger of God is here". Reading her life, its hard to disagree. Thank you once again and please bless my family and I.
I was cured through the prayers of Rhoda Wise when an infant. My mother who was very young took me to her house with my Grandmother who of it. Rhoda set me on her lap and placed a relic on my chest which had some type of consistant raddle, after which it ceased. I live close to her house to this day and often stop to thank her for her prayers. The Priest in charge of her when in the hospital was our former paster and benefactor at the school I attended paying full tuition for Catholic high school. Rhoda, Pray for us. Thank you for sharing your interesting story of how you were cured as a child through the intercession of Rhoda Wise. It is really wonderful to hear of your longtime and continued devotion to her. After calling off my wedding in June, I traveled to Canton Ohio in July to visit the shrine. I prayed for the intercession of Rhoda Wise to reunite me and my fiance. I was glad we did not marry because we had things to work on but very much wanted to still be with her, after not speaking with her for 10 weeks, a week after my visit to Canton we reunited. During that same time I handed over a novena to Rhoda Wise to a friend whose sister had stage three cancer. They were going to visit the shrine but she was too sick, well the sister pulled out of it and the cancer is gone. Does Rhoda have a postulator for her cause? Thanks for sharing your experiences concerning the answered prayers and intercessions of Rhoda Wise. As far as I know there has not yet been an offcial cause opened for her beatification/canonization. As you know the local diocesan Bishop would need to begin the process, and I have not read any documetation stating that this has been done thusfar. The kind souls at her shrine would certainly have more informsation concerning this. For what it is worth, it does seem to me that there is sufficient grounds for opening her cause because firstly she undoubtably lived and practiced virtues to a most heroic degree, and secondly there has certainly been a significant cult of devotion for over 60 years--ever since her death in 1948. So, if God so wills it, hopefully her cause will be opened soon. -Rhoda Wise, pray for us! "O beautiful Rose of Carmel, Saint Therese of the Infant Jesus, deign according to your promise to descend from Heaven to visit those who implore you. Pour down upon us in profusion those Celestial Graces that are symbolized by the shower of roses that Jesus, your Spouse, had put at your disposal. I just wanted to let you know that I drove over to Canton, OH yesterday so that I could visit the house of Rhoda Wise. It was about a four and a half hour drive each way but it was well worth the journey. To see the house for myself and to spend even just a little bit of time there was a wonderful experience. I made a point to pray for you while I was there in Rhoda's room before the beautiful altar. I learned about Rhoda through your website. I am really glad to hear that you were able to make a pilgrimage to the Rhoda Wise house-chapel! I too hope to be able to go someday.. And I am really happy to know that you remembered me in your prayers while you were there--I sincerely appreciate your thoughfulness. May God bless you in return for your kindness. Reading the life of Rhoda really made a big impression upon me. God granted her some remarkable graces and one can really see the hand of God in her life. Also her conversion and entrance into the Catholic church was very extraordinary, I think. Thanks again Father Todd for your prayers and may God bless you and draw you ever closer to Himself. I visited the Rhoda Wise shrine on Good Friday 2013. I went because I read about her in a book about Mother Angelica, who was healed after visiting Rhoda Wise. I also went because of my health problems. My husband and I had the most moving experience there. She was truly a holy woman. I prayed for a specific miracle for myself, but God granted another one so much better for my husband and me. You see, my husband never prayed the rosary and this bothered me. Well since our visit, he prays the rosary EVERY morning. We pray it together as well. He use to complain if I wanted to pray the rosary while we were in the car. No more! We pray together. God is so good. What a beautiful grace that you received with your husband through the intercession and help of Rhoda Wise---Blessed be God!!! The conversion of a soul is such a extraordinary grace! My dear mom used to chauffeur Mrs. Wise around to various convents and churches. I went along several times but I was only a child.I was healed of deafness in my left ear a few years ago though some blessed water from her house. My mom compiled a memories book of Mrs. Wise that i recently gave to the Bishop's Tribunal. Thanks so much for sharing a bit of your mom's experiences with Rhoda Wise---she was certainly blessed to have known her. Please feel free to share any of you mom's experiences here in the "comments" section as I am sure that those of us who are devoted to Rhoda Wise would love to hear them. My Gran and I make frequent sojourns to Rhoda Wise's gravesite (she has a bench in front of her headstone, and it's always well kept)--she's buried not far from my Grandfather in St. Peter's Cemetery here in Canton. We also make frequent trips to the house to pray and light candles and get our holy water. We also have nice, long visits with Karen. (My Gran is very good friends with her.) The house has changed much than from when I was a child, since EWTN bought the property and renovated it a bit--though I will say, the grotto they put in is lovely--, but the energy of being in a place where miracles happened is still very much the same. I am honoured to say that Karen actually let me sit in the chair in which Jesus appeared to Rhoda. It was an amazing experience I will never forget. Do you know, are her miracles recognised or approved by the church? Or is it up in the air? ****UPDATE: After an informal investigation, Bishop George V. Murry S.J. gave the Nihil Obstat to the work of Rhoda Wise Shrine, Inc. on June 9, 2015. -For more info, see the update and the link at the bottom of the article. Her story is truly inspiring i've red it like 5 times already and always have the same feeling of the love of God. I just want to share that the very first time i red it i immedietely print two copy of it and gave the other to my grandma and she also like the story very much and made me to have another copy to give to her friend which has a radio program that programmed all about catholicism including miraculous happenings and mystics. She thanked me and my grandma for that and though I forgot to gave her the links of this site but i will give it to her so that she can have an access to this very wonderful site. Though the first story is a good one the other is a little bit sad, theres a neighbor of us,she has a cancer, her husband is a good friend of my father. They were good people but i notice they have small faith in God but i do not judge them. I think of Rhoda Wise and print another 2 copy of her story plus compose a healing prayer through the intercession of Rhoda Wise. Weeks and months have passed i still did not manage to give her story to them until her very death. I feel so sorry and consider myself a failure servant, because i did not give and pass the hope that Jesus gave to me. But i felt a little comfort when my grandma said she was on her bedside and manage to say divine mercy chaplet and the prayer for a happy death to St. Joseph, my grandma said she died peacefully before she finish the chaplet and maybe my gramdma said "she just really need prayer so that she can die with peace". As of now i still have the two copies of the Rhoda story, the other copy is for my uncle who will have a vacation here at us, who converted to another religion and for the other one copy i will do my best to give it to a sick person who is in need of the healing love and mercy of Jesus. I won't disappoint God again i will pass her story to inspire others as i was inspired by her and by the love of God. O Servant of God, Rhoda Wise. You have been miraculously healed, both physically and spiritually, by Our Lord Jesus Christ. Grant that through your intercession, that i may also experience the true healing power of the Love and Mercy of Our Lord Jesus. Speak for me to the Most Holy Hearts of Jesus and Mary, tell them to touch me with their healing hands, and to take away this illnesses that i have in my body, mind, heart and soul, if all of this is according to the Will of God. Amen. Beautiful prayer, Mr. Ree. Thank you. I really love the quote "Faith cures all things". First heard of Rhoda wise from mother Angelica. Tried to search for her story in vain, today I have deep joy. Amazing faith story! !